Nike's Brazil Copa America Jersey Celebrates a 100-Year Victory! Home / International Football / Americas / Nike’s Brazil Copa America Jersey Celebrates a 100-Year Victory! In 1919, Brazil hosted the first edition of Copa America. 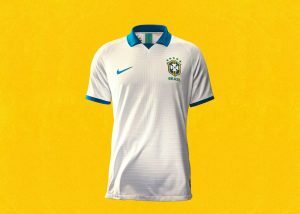 Wearing a white kit, the team made history that year by winning the tournament at home and starting a journey of victories that transformed Brazilian football into a national icon. The Brazilian National Team will debut the 2019-20 Brazil Copa America 100th Anniversary Jersey as part of a special uniform at the first match of the tournament. Previous COPA90: Football In Paradise – India’s Unexpected Footballing Capital! Next XtraTime VIDEO: AIFF GS Kushal Das says One Indian Football League to come!